Lead like a Woman is a podcast that falls under the Sumi Krishnan personal brand. Pictured here is the logo and cover for the soon to be released podcast. The podcast features real, raw stories of women leaders from around the globe through their backgrounds, successes, advice, struggles, and more. The logo is created to celebrate femininity and simultaneously celebrate badass women of the past. Keeping in line with the Entrepreneurs Rising sister brand, the “woman” aspect of the logo is modeled after a recent guerrilla sticker campaign (modeled from feminist stickers of the 60s). This campaign, entitled “This Oppresses Woman” featured stickers that viewers would slap on public advertisements that objectified women. It was a powerful public campaign that gave some power back to women being portrayed and used to sell countless products. The background color references a wine stain - giving the otherwise polished piece a harsher feeling - one of freedom, messiness, and F*** This. Rough draft mock-ups of potential new logos for the Fine Arts Work Center 50th anniversary created in collaboration with Dickinson Lab. Pictured here are two of six panels aimed at exploring how to elevate the existing brand and interact with existing artworks. This project conveys two different brand identities for one pasta company. The first mock-up is envisioned to be made of recycled aluminum. Aluminum is infinitely recyclable without degrading, keeps food fresh and is cheap to produce in mass. In addition, the shape and color would stand out clearly in an aisle. This design is aimed at young adults living on their own who need a nicer meal. The cap of the pasta contains two different sized holes: the first is the size of one serving of pasta and the second, two servings. This makes it easier to cook for one and save the rest. The windows are included so show the different colors of the pasta based on their flavor, functioning as visual intrigue and assurance of the quality of the ingredients being used. The elegant packaging can be saved and re-purposed afterwards, or is fully recyclable into more packaging. The second version of the design, produced in half height (for smaller pots) out of recycled cardboard is aimed at college students and young adults who need a good cheap meal and are perhaps just starting to learn how to cook. The packaging is fun, friendly, and humorous. It is designed with simple line-work and printed on recycled cardboard to minimize environmental impact. Each of the different flavors is a pun off of a great Italian artist, and the window into the pasta is a gold, wheat inspired, frame. 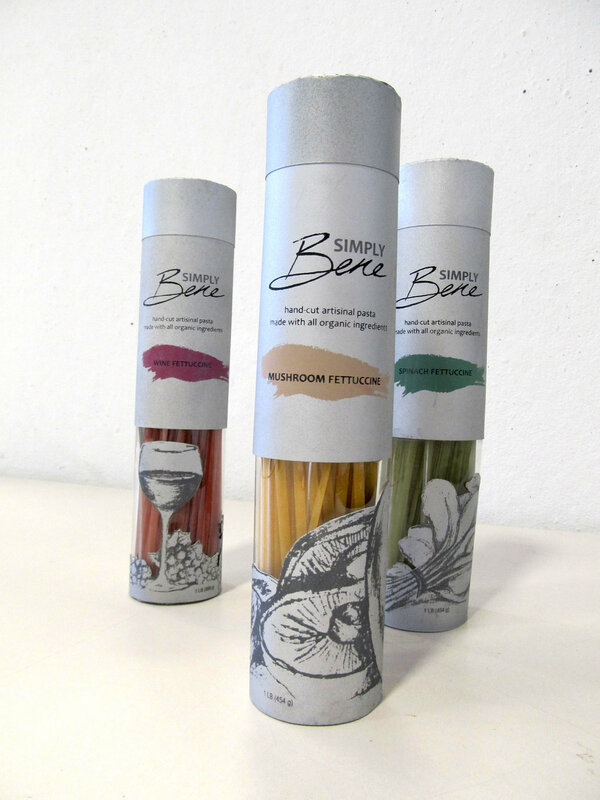 The design and packaging work together to portray the company motto: Pasta is our masterpiece. The top contains three different tabs sized for one, two, or three servings of pasta. The tab can than fold back in to seal the remainder of the pasta. This makes cooking for one easy and hassle free. In addition, the bare bones packaging will stand out on the shelf and help to convey the company promise of perfection through simplicity. Entrepreneurs Rising is a coaching academy and social movement to help build companies that serve and move humanity forwards. The logo design is created to infuse contemporary style with a nod to grassroots political art techniques. Utilizing the hashtag form as a frequent tool for current movements and the hand-drawn touch of banner design, the Entrepreneurs Rising logo pays homage to the many people on the front lines that have come before us to make change possible. Core to the Entrepreneurs Rising branding is moments of hand drawn imagery, and nods to grassroots arts campaigns. Pictured here is one page of the Entrepreneurs Rising branding guidelines detailing the logo colors, fonts, and correct usage across all mediums.